There is a small group of people who are really trying to get me to ditch all my New Year’s resolution efforts and are creating havoc for my waistline. They are adorable and hard to say no to with their cute, smiling faces. That's right, you might have guessed it by now...I’m talking about the one and only girl scouts and their delicious, addicting cookies. I'd like to think 100% of the reason I buy the cookies is to support a good cause and support these cute little gals, but let's be honest, it's definitely about those cookies too, friends! I usually stick to my guns and buy my go-to's: Thin Mints and Samoas, but this year I tried one more kind and was definitely impressed! I'm convinced you cannot go wrong no matter what flavor you buy. But as a side note: buy the Lemonades. They are positively delicious! It is a pretty decent sized shortbread cookie with lemon icing. They are really light and lovely. If you are a lover of all things lemon like me, you have GOT to try these ones too! See what I mean? Yuuuuuummmy! It has kind of a long list of ingredients, but do not let that scare you, it is quite simple. It consists of chocolate cheesecake, toasted coconut, Samoa Cookies, whipped cream, caramel, and chocolate all layered between sheets of flaky Phyllo pastry. Oh! So! Good! 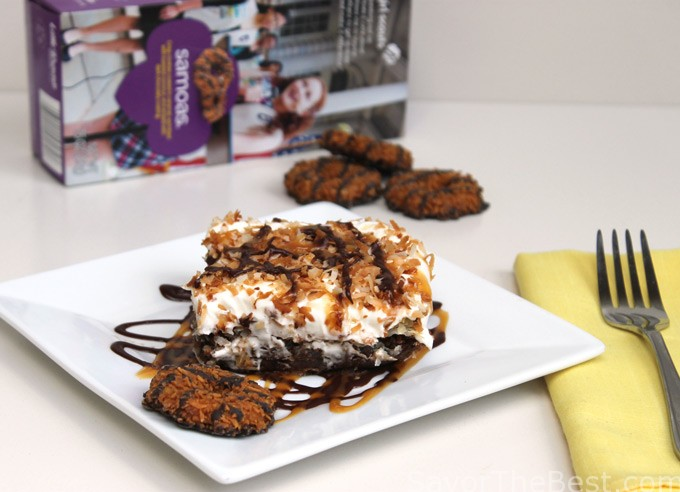 Now get out there and support those girl scouts and get these cookies to make this amazing dessert. You will not regret it! Preheat oven to 350°. Spray an 8” x 8” baking dish with nonstick cooking spray. In a large mixing bowl, beat the cream cheese and sugar on medium high speed until creamy. Add the egg and blend until just combined. Add the melted chocolate, coffee granules, and vanilla then mix on medium speed for 2 to 3 minutes, stopping the mixer half way through to scrape down the sides and incorporate all the ingredients. Cut the Phyllo sheets to and 8” x 8” square. Place one sheet on the bottom of the dish. Lightly brush the sheet with butter then repeat with 4 more sheets of phyllo dough. Keep the rest of the Phyllo sheets covered with a damp paper towel until ready to use again. Spread half of the cream cheese mixture over the Phyllo sheets. Sprinkle with ¼ cup of toasted coconut then half of the crumbled Samoa cookies. Top the Samoa cookies with 5 more sheets of Phyllo dough that has been brushed with butter. 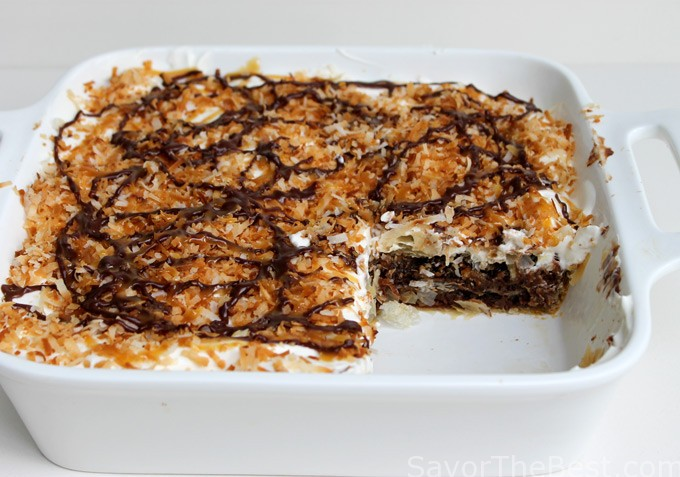 Spread the rest of the cream cheese mixture over the second layer of Phyllo dough and top with ¼ cup of toasted coconut and the rest of the Samoa cookie crumbs. Top with 5 more sheets of Phyllo dough that have been brushed with butter. Place the dish in the oven and bake for 25 to 28 minutes or until golden brown on top. Remove from the oven and allow to cool down completely. Place the cream and the powdered sugar in a mixing bowl. Whisk on medium high speed until the cream reaches stiff peaks. Spread the cream on top of the dessert then sprinkle the ½ cup of toasted coconut and drizzle the chocolate and caramel syrup over that.